Fall is by far my favorite season of the year so I am happy to share with you my recipe for pumpkin chocolate chip muffins. I used to make these with whole wheat flour but since I have tried to cut gluten out of my diet (for the most part) I decided to alter my recipe to make it gluten free and also dairy free. Bonus is that my kids love them too so I can feel good about letting them have one for breakfast or for an occasional treat! Preheat oven to 400 degrees. Mix truvia, oil, and eggs. Add pumpkin and water and stir. In separate bowl mix together the flour, baking soda, baking powder, spices and salt. Add wet mixture and stir in chocolate chips. Fill muffin cups 2/3 full with batter. Bake in preheated oven for about 17 minutes depending on oven. 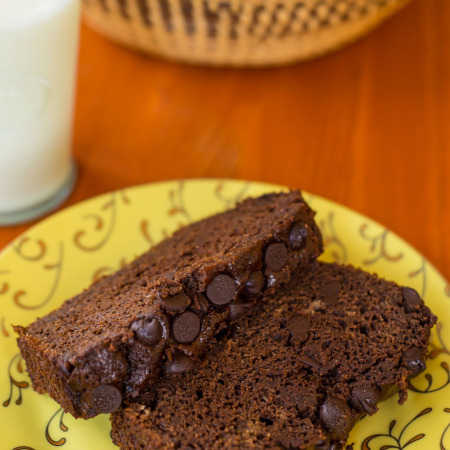 These Banana Chocolate Chip Muffins are amazing and even better that they are gluten free. Seriously they are so delicious! Peel and slice 4 very ripe bananas into chunks. Put them in a large bowl and mash the bananas. Stir in the canola oil. Crack the egg into a small bowl. Beat the egg with a fork. Add the egg, stevia, and vanilla to the banana mixture. Stir in the baking soda and the salt. Mix in the flour and the chocolate then pour it into the muffin cups. Bake for 18-19 minutes. Enjoy!! This is one of my favorite treats to make. It is really hard for me not to make this every week! The entire family loves it. Over the months I have played around with the recipe to make it healthier. Make a loaf and enjoy! Preheat oven to 350 degrees. Peel and slice the bananas into chunks. Put them into a large bowl and mash them using a potato masher. Stir in the canola oil. Crack the egg into a small bowl and beat it with a fork. Add the egg, stevia, vanilla, baking soda and salt. Then stir in the flour and chocolate chips. Then pour into a greased loaf pan. Bake for about 50 minutes. (I usually take mine out at 48 mins) Enjoy!!! I stumbled upon this delicious recipe for Quinoa Fruit Salad on Pinterest and decided to try it out. It is amazing! It makes a great side dish or snack. It would even be good to eat for breakfast. You can add whatever fruit you like or have on hand. I love mangos, so I knew I had to add those. Also added blueberries and strawberries. Note: Use your favorite fruit in this salad. Blackberries, peaches, kiwi, raspberries, pineapple, grapes, etc. are great options!